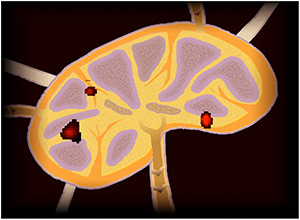 he future of tailored cancer drug therapy lies within the lima bean-shaped image on a computer screen in Illinois Tech’s Medical Imaging Research Center. 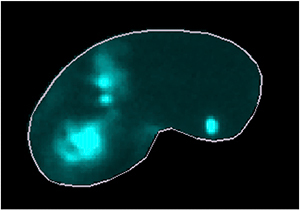 The image depicts a whole porcine lymph node illuminated by bright red and green points of injected fluorescent dyes and is the first produced with the ADEPT Cancer Imager. 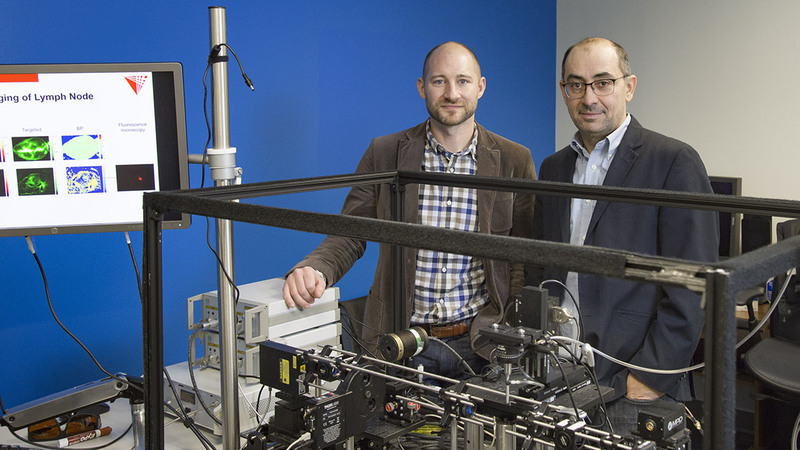 The innovative device produces a 3-D high-resolution molecular map of a piece of tissue such as a lymph node indicating microscopic areas where cancer has spread, and at a far more minute level than existing imagers. Tichauer’s research group is currently working with pig lymph nodes that have been injected with human cells or cells harvested from human cancer grown in an immune-compromised mouse. These nodes are then injected with biologically active fluorescent substances (fluorophores, which display as red and green) that chemically interact with the tissue, seeking out proteins that are over-expressed by breast cancer. 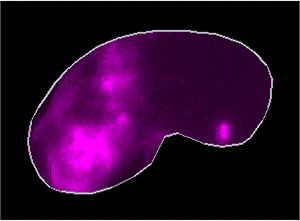 The node is then suspended in the imager and photons, or light particles, pass through the tissue, resulting in a cross-sectional image displaying a “map” of where the red and green dyes, also known as paired agents, have traveled. The tissue specimen can be rotated 360 degrees in the ADEPT chamber so that a 3-D reconstruction can be produced. A larger amount of the protein-seeking dye indicates the presence of cancer while an equivalent proportion of dye distribution would indicate no presence of cancer. Tichauer came up with the idea for two-color imaging for cancer detection while he was a postdoc at Dartmouth College, exploring the kinetics of imaging agents in tissue and applying mathematical models to extract quantitative information. At Illinois Tech he formed the ADEPT team with co-principal investigators Jovan Brankov (M.S. EE ’99, Ph.D. ’02), a systems development expert and associate professor of biomedical engineering/electrical and computer engineering, and Rajendra Mehta, a biologist with IIT Research Institute. 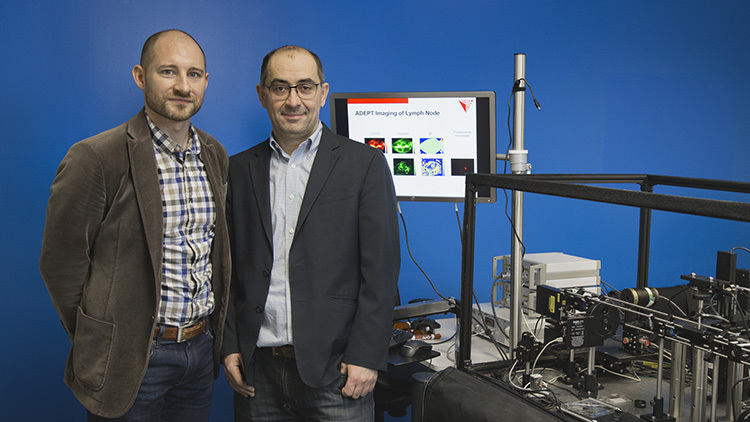 In 2016 the ADEPT Cancer Imager was selected over two other faculty teams to advance to the second phase of Illinois Tech’s Nayar Prize I. Trustee Madhavan Nayar (M.S. IE ’68) and his wife, Teresa, on behalf of the Nayar Family Foundation, established a $1 million gift to fund the Nayar Prize I (and later, Nayar Prize II) to challenge university faculty, staff, and students to develop breakthrough, innovative projects that will, within three years, produce meaningful results with a societal impact. Tichauer was also funded through a National Science Foundation Faculty Early Career Development (CAREER) Award in 2017 to further refine the imager. The researchers credit their cadre of undergraduate and graduate students with making important contributions to the project. Doctoral student Cynthia Li (BME Ph.D. student) contributed to the development of the pig lymph node procedure. Lagnojita Sinha (BME Ph.D. student), Tichauer’s student since 2013, helped build the imager. Brankov provides a sobering statistic that underscores the researchers’ ultimate goal behind the creation of the ADEPT Cancer Imager.